Remember St. Luke? That is he up above. I have just received confirmation from Rome that the statue in question is, indeed, St. Luke. My friend Brendan who is in Rome sent me a note and he said that is who the statue is, without a doubt. Which thrilled me! I mean, I knew that already, thanks to my friend Missy. But to hear it from Rome! It makes me feel I should get a plaque or something and affix it to St. Luke, saying that this authentication from Rome was received. It would be just what he needs. I like that statue, you know? I like its simple, almost primitive nature. 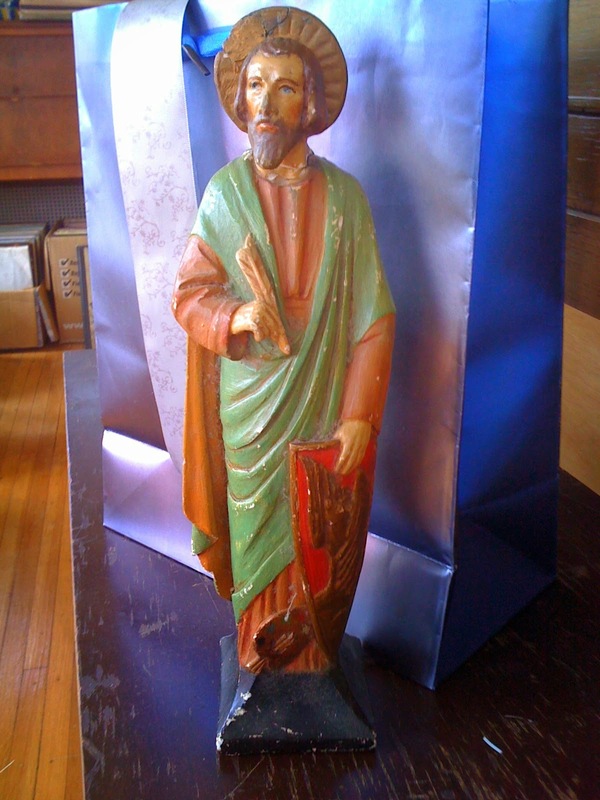 Elsewhere on the St. Luke front, I glued on his head. So now he is headless no more. I cannot believe that what with Leonard Pennario and everything I got around to gluing on St. Luke's head. I mean, it was not a difficult job. But I never get to anything like that. Finally I have! That is why these days St. Luke and St. Joseph are not the only ones around the house with a halo.